At Satara Home & Baby, our Holy Lamb fleece crib mattress topper can help children get the vital sleep they need. Sleep is an integral part of a baby’s growth. In fact, it can greatly affect a child’s physical and mental development. However, not all kids can sleep comfortably. One of the biggest reasons for this problem is how children’s beds are made. Some crib mattresses do not have enough cushioning to comfortably support the child’s body. Crib mattresses are intentionally firm for infants but as babies grow older some additional softness may be desired. Check with your pediatrician for guidance on the appropriate age to add the topper to your baby's bed. If your child is having trouble sleeping, Satara Home & Baby can help. We are proud to bring you the Holy Lamb fleece crib mattress topper, the ideal solution for your child’s sleeping problems! Before you visit our store, it is important to know why choosing the right crib mattress topper is vital. Doing so can help you get the most out of your purchase. After all, buying the wrong one can be very costly. Take the time to read the Frequently Asked Questions (FAQs) section below to find out more about crib mattress toppers. You will also know how, where, and why you should purchase the Holy Lamb fleece crib mattress topper. Why Is Choosing a Crib Mattress Topper Important? Selecting an organic crib mattress topper is easier said than done. With so many sizes and types available in the market today, you could feel overwhelmed and somewhat stressed about the whole idea of getting one. Do not fret because Satara Home & Baby might just have the solution not just to this ordeal but also to all of your child’s sleep issues! We are happy to introduce you to the Holy Lamb fleece crib mattress topper. Below are some relevant facts and information that you need to know about the latest addition to our ever-growing selection of organic and natural comforters and mattress pads, which promote healthy sleep. 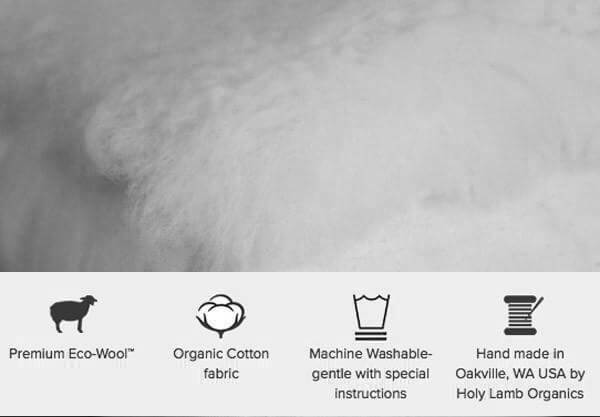 Now, before you read ahead, we just want you to know that all our items, including the Holy Lamb fleece crib mattress topper, are crafted with organic cotton, pure wool, and natural latex. Believe it or not, these particular materials are known to minimize exposure to toxic chemicals and promote healthy sleep for a long period of time. What Exactly Is the Holy Lamb Fleece Crib Mattress Topper? The Holy Lamb fleece crib mattress topper is specially designed to enhance a child's sleeping experience. It features soft, cloud-like exposed wool that is carefully woven into an organic backing. With our fleece crib mattress topper, your child will enter a deep, healthy sleep! Your little ones will surely enjoy snoozing on a Holy Lamb fleece crib mattress topper, especially if they prefer the option of a plush bed. Continue reading to know what separates our fleece crib mattress topper from other types of crib mattress toppers. What Sets the Holy Lamb Fleece Crib Mattress Topper Apart? Did you know that the Holy Lamb fleece crib mattress topper can help your child relax and sleep better? The secret lies in the material of the crib mattress topper itself. The covering features super soft premium eco-wool fleece woven into a backing of 100% organic cotton. The fleece absorbs and releases moisture, moving sweat away from the body. It also helps prevent your child from feeling cold and clammy, maintaining a comfortable body temperature throughout the night. In addition, our fleece crib mattress topper naturally deters dust mites and other harmful elements. That way, you will not have to worry about anything that may get in the way of your child's sleep. Why Should I Buy the Holy Lamb Fleece Crib Mattress Topper? For one, the Holy Lamb fleece crib mattress topper is one of the most affordable options at present. With so many features, this product provides the best bang for your buck! The reason, you may ask? We put affordability and quality over anything else, so we see to it that our toppers match, if not exceed, your expectations. Apart from that, we have partnered with reputable mattress makers to bring you pure, safe alternatives to conventional mattresses and beddings. These factors, including the fact that we carry the Holy Lamb fleece crib mattress topper, are what make Satara Home & Baby a trusted company for customers looking for high-quality bedding, mattress toppers, and other premium bedroom goods. How Long Can the Holy Lamb Fleece Crib Mattress Topper Last? That is a very good question! With proper care and maintenance, the Holy Lamb fleece crib mattress topper can last for a long time. The topper may be machine washed with special instructions provided with your topper. Rest assured that our fleece crib mattress topper is more than capable of withstanding regular use for many years to come. Who Should Purchase the Holy Lamb Fleece Crib Mattress Topper? Parents with a young toddler should consider getting themselves the Holy Lamb fleece crib mattress topper. Older babies, particularly those who have trouble sleeping at night on a regular basis, will appreciate the Holy Lamb fleece crib mattress topper. It has a soft texture that provides all-night support and comfort. On top of that, our fleece crib mattress topper is lightweight and washable, making cleanup a breeze for parents! Whether you are a new or long-time parent of a toddler, the Holy Lamb fleece crib mattress topper can help you address all of your child’s sleeping problems and needs. For your added benefit, we also carry a vast selection of organic and natural goods that promote healthy sleep and rest for your children. Is the Holy Lamb Fleece Crib Mattress Topper Beneficial for My Baby? How Can I Purchase the Holy Lamb Fleece Crib Mattress Topper? All you have to do is to call us at 1 (608) 251-4905. Orders will be shipped straight to your doorstep. If you have questions about our pads, our staff are always available to assist you. When and Where Can I Buy the Holy Lamb Fleece Crib Mattress Topper? You may visit our store in Middleton, WI. There, you can take a closer look at all of the products we have to offer you. We are open on weekdays, from 10:00 AM to 6:00 PM, as well as on Saturdays, from 10:00 AM to 5:00 PM. What Are the Payment Methods for the Holy Lamb Fleece Crib Mattress Topper? Satara Home & Baby currently accepts Visa, MasterCard, Discover, and American Express as modes of payment for the Holy Lamb fleece crib mattress topper. Now that you have read what the Holy Lamb fleece crib mattress topper is all about, it is time to make that purchase! Give us a call today at (608) 251-4905 to place your order. Also, make sure that you visit our website regularly for news and updates about our business and the Holy Lamb fleece crib mattress topper we have for you.